Since ancient times pottery, simply obtained by firing a mix of earth and water, enables people to cook their food and decorate their houses. Earthenware was thus very well known and exploited by Hittites, Semitic people, Greeks, Etruscans, and Romans. In China, already in the third millenium B.C., efficient kilns enabled local clay which was particularly rich of alumina to be fired at high temperatures. 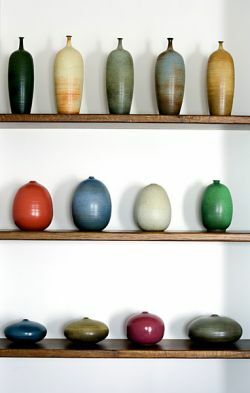 By using this ancient Chinese technique the so-called “stoneware” pottery has been produced. 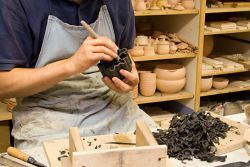 Stoneware is a special type of very hard, non-porous, partially vitrified ware, which is particularly suitable for making food containers and for creating artistic objects. Our potters were trained in France by Gérard Pott, former student of Daniel de Montmollin, and in Italy by Gianni Beccafichi, one of the most known Italian potters. 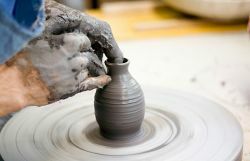 Our pottery is made exclusively by the potter's hands and thrown on the wheel, glazed with natural colours and ashes (e.g., ashes of hay, vine-shoots, lavender, or fern), and fired at 1300° C, according to ancient techniques.